Allure Tea - Tea information about camellia sinensis. How do you like your tea? Hot or iced? Sweet tea? From a beautiful bone china teapot or a homely thermos jug? No matter how it is served, tea is good for you. 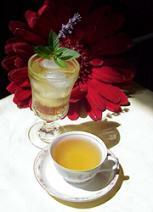 It provides moments of respite and even the habitual preparation of the tea water to tea leaves is refreshing. As Frank Murphy writes, it is the spirit of tea. Tea has many meanings from technical to social. It is made only from the dried leaves of Camellia sinensis, a perennial evergreen shrub. Green tea, oolong tea, white tea and black tea are all derived from the same plant. Tea varieties reflect the growing region (for example, Ceylon or Assam), the district (for example, Darjeeling), the form (for example, pekoe is a grade of tea, gunpowder is rolled), and the processing method (white, green, oolong or black). Tea is produced in about 60 countries around the world including the United States of America. Although China has the largest land mass for tea production, most of its tea is consumed by its residents. India, Kenya and Sri Lanka (Ceylon) usually vie for top tea exporting countries. Tea has a long history of use dating back to Shen Nung, the Divine Husbandsman, in China approximately 5,000 years ago. The famous emperor is said to have tasted hundreds of herbs to define their medicinal value. Some writings attribute 365 traditional medicinals to his research. He is reputed to be the author of Shen-nung pen ts'ao ching (Divine Husbandman's Materia Medica), the earliest extant Chinese pharmacopoeia and is considered the Father of Chinese Medicine. Historically, tea has been served as a part of various ceremonies and has been used to stay alert during long meditations. A legend in India describes the story of Prince Bodhidharma, the founder of Buddhism, who tore off his eyelids in frustration at his inability to stay awake during meditation while journeying through China. A tea plant sprouted from the spot where his eyelids fell providing him with the ability to stay awake, meditate, and reach enlightenment.